Aging changes the skin, but there are ways to help keep it healthy. From diminishing skin blemishes to reducing the appearance of fine lines, there are many natural ways to help seniors reduce the signs of aging and help skin stay healthier longer. 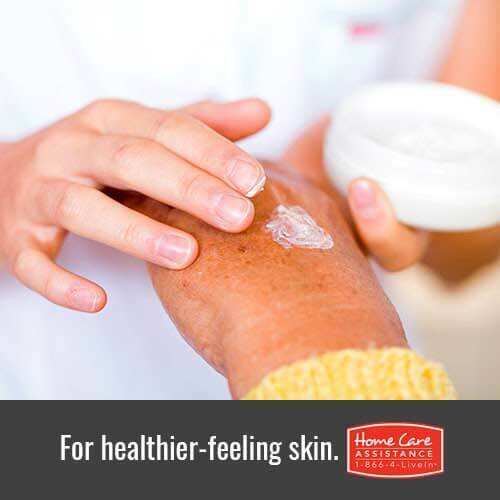 At Oakville Home Care Assistance, our senior care experts have compiled several tips that can help ensure senior skin looks and stays healthy. Drinking sufficient water is essential to healthy skin because hydration helps skin stay elastic and can reduce the appearance of fine lines. Water can also flush toxins from the body and can promote good circulation, in turn contributing to a healthy glow. To help your senior loved one maintain healthy skin, encourage him or her to drink several tall glasses of water a day. While you may already know that using lotion can protect your loved one’s skin, you might not realize that the ingredients in the lotion matter. To promote supple skin, pick body lotions with cocoa butter and vitamin E, which hydrate the skin and provide nutrients that help reduce lines and creases. If your loved one is concerned about skin blemishes, Vitamin E is particularly helpful for smoothing out discoloration, while cocoa butter may decrease the visibility of scars. With age, your loved one’s skin becomes thinner and can burn faster and deeper. Sun exposure can also speed up aging, dry out the skin, and cause skin cancer. Help your loved one keep his or her skin safe from the sun by encouraging him or her to wear sunscreen, sun hats, and light, long sleeve shirts and pants, when it is sunny. A healthy diet provides the nutrients necessary to maintain skin health. Green vegetables are particularly good sources of antioxidants, which help protect the skin, as well as a variety of other nutrients that promote a healthy metabolism. Maintaining a healthy weight is also good for the skin, reducing chances for stretch marks and wrinkles. Help your loved one eat right by asking his or her Oakville part-time caregiver to serve healthy meals that include leafy greens and other wholesome vegetables. Regular massages can help promote senior skin health by relieving stress and muscle tension. As stress can cause wrinkles around the eyes and lips, helping your loved one relax can reduce the effects of daily stressors on these delicate skin areas. Likewise, tension that builds up in the muscles of the face and neck can create wrinkles. Getting routine massages can both help keep your loved one’s skin healthy and give him or her an hour of pleasant relaxation time. At Home Care Assistance, we are dedicated to promoting senior health and wellness by providing high-quality senior home care. Whether your senior loved one could use minimal assistance with daily tasks, or he or she needs more comprehensive assistance for Parkinson’s care in Oakville, our experienced caregivers can provide the help your loved one needs to stay safe and comfortable in his or her own home. Reach out to a Care Manager at (519) 590 2792 to learn more and to schedule a no-obligation in-home consultation.